In the past, I’ve seasoned hamburger patties on the grill…while they were grilling. And while it works, it wasn’t going to work for me last weekend when we were having a bunch of family over for dinner. I wanted to prep as much as I could ahead of time so that I could enjoy them while they were at our house, instead of running around my kitchen like a chicken without a head (sorry, bad visual! )…so this is what happened. So that’s what I did. Sprinkle seasoning on the cookie sheet. Make patties and then put them on top of the seasoning and move around a little to “catch it all” and waste as little as possible. Sprinkle more on top and voila. And while I didn’t get all scientific about it, it seemed to me that the seasoning stuck to the burgers better and less fell through into the grill! How about you? 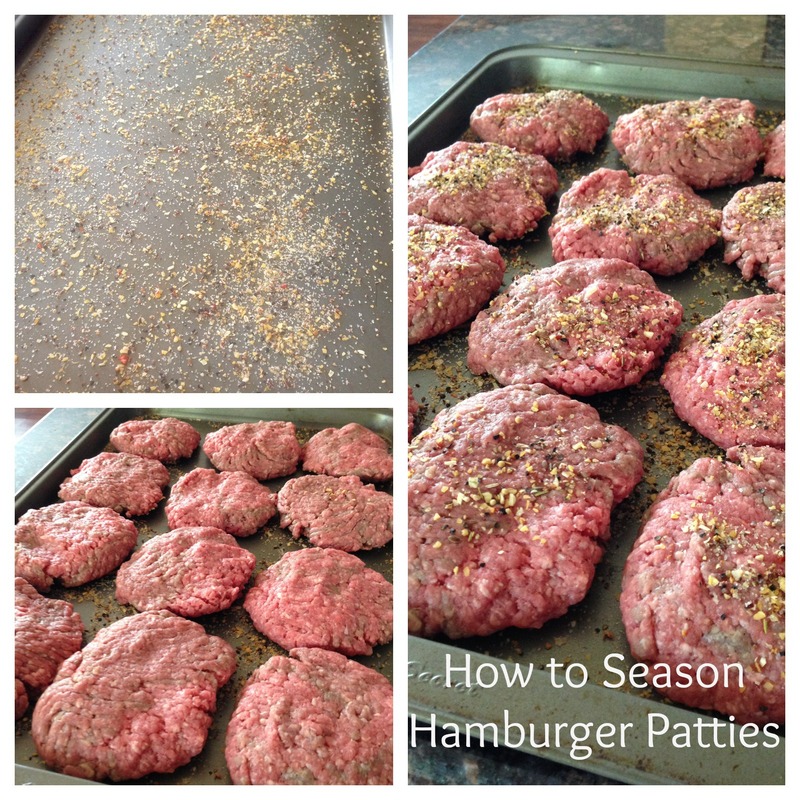 How do you season hamburger patties? I’ve never thought to season hamburger patties that way… I just mix everything together when I’m making the patties – that way the seasonings are mixed throughout. Is there an advantage to just doing the seasoning on the top and bottom? Oh, wow! I hadn’t thought of this before. My mom always tells me to season on a tray so I won’t make a mess, but this ensures no mess and flavor! I season on one side right before they go on the grill or in the pan. I put that side down and then season the other side. The reason I do that is that salt draws out the moisture in meat and I don’t want that to happen before they are cooked. It sounds like a good idea to season the tray, but I would still do it right before cooking. I always mix in either homemade ranch seasoning or homemade onion soup seasoning into the meat when I make the patties. They always turn out excellent. I’m also a fan of the season while making, I like add in a minced onion and worcestershire sauce. I mix in the seasoning with the meat and then form into patties. I also mix in diced onions and sometimes cheddar cheese and BBQ sauce, amongst other things! I love your idea so much – but I would like to know what seasonings you used on your hamburger patties ? Thank you so much I love your blog also great ideas & awesome recipes ! I’m like the above ladies- I mix the seasonings right into the meat before I form the patties. Some salt, pepper, onion powder, garlic powder, and worcestershire sauce. Mmm mm!